Every now and then, it's really nice to have family or friends around for dinner. But hosting a dinner party can take its toll on the host. There is just so much to plan for, and preparations go on even during the party itself. Usually, a host will only be able to relax after an event, which will surely take the fun out of any special occasion. But hosting dinner parties should not be so stressful. People can make things easier for them by opting for simple yet classic preparations. So, instead of stressing out on very fancy appetizers that take hours to prepare, why not opt for meat and cheese trays? This way, you'll have more time and energy for the entree and dessert that you'll be serving. When selecting what kinds of cheese to include, keep in mind that you should provide a selection of cheese with different textures and flavors. For instance, arrange soft cheese, like Camembert, on one section, while have some selections of firm cheese, such as Parmigiano-Reggiano or Manchego, on the opposite section. Aside from texture, try offering different kinds of cheese based on what type of milk these are made of. 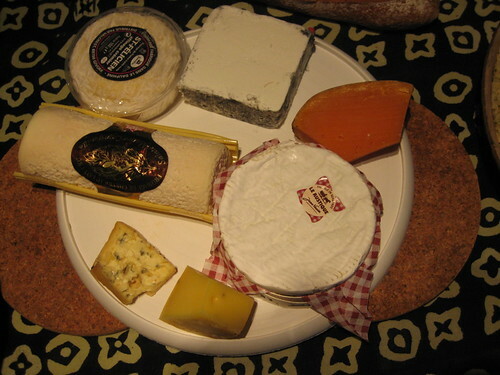 There is cheese made from cow's milk or goat's milk, for example. Don't forget widely liked and familiar cheese, like Swiss cheese and, of course, the all-American cheddar cheese. Brie, which is often cut in wedges, provolone, blue cheese or aged cheddar are also wonderful options. Cheese, as we all know, goes well with just about anything. So, when serving up cheese platters, provide familiar accompaniments as well. Offer breads and crackers, as well as an assortment of fresh and dried fruits. Apples and pears are fruits that go really well with cheese. You can also provide preserves and other dips, and veggies, like caramelized onions, tomatoes, and roasted peppers. Cured meats are often served with cheese too. There are several kinds of meats that you can readily serve on a platter. You can offer slivers of succulent cooked meat like smoked ham, grilled chicken, or roast beef. Cured meats and sausages, such as prosciutto, pancetta, and salami, are pretty popular as well. Dips also add complexity to the flavor of meat, so make sure to supply spicy barbeque sauce, mustard dips, and other apt sweet or savory condiments. You won't go wrong when you also accompany a meat platter with horseradish, capers, as well as an assortment of olives. How Much Meat and Cheese Should You Serve? On average, a pound of sliced meat is apt for about 6 people, while a pound of cheese will serve around 3 to 4 people. In case you are also serving other appetizers, such as veggie and fruit platters, prepare about 3 ounces of cheese per person and about a pound of meat for 8 to 10 people. Be a bit cautious in case you're planning on serving meat trays because these need to be refrigerated. Once served, a meat tray should be good for 4 to 5 hours. After that time has elapsed, discard remaining meat or meat that has not been consumed. This way, you avoid getting sick. Claire Kendall is a freelance blogger who writes articles about food and housekeeping. She also blogs for www.justcatering.net and many other food websites.